A lease is a long term agreement to rent equipment, land, buildings, or any other asset. Leasing an asset from the lessor or purchase of an asset by borrowing the full purchase price of an asset should be compared as financing alternatives that are dependent on the investment decision. 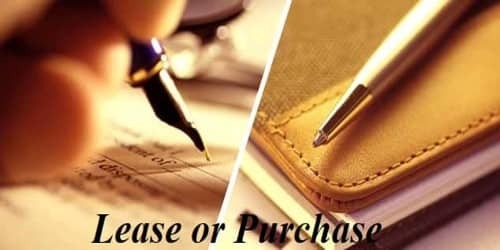 It is a contract between the owner (lesser) and the lessee for the hiring of a specific asset. Determine the after-tax cash outflow for each year under lease alternative as under (Lease payment amount – tax benefit on lease payment=$..) tax rate X lease payment. Determine the present value of after-tax cash outflows under the leasing option. Then, determine the present value of after-tax cash outflows under the buying or borrowing option. Determine the NPV of after-tax cash outflow amount using the after-tax cost of capital (cost of capital X tax rate) or Cost of capital(1-tax rate). That is, determine the PV of cash flows associated with the leasing alternative. Determine the after-tax cash outflow under buying alternative based on borrowing (PV of the purchase price – PV of tax benefits of depreciation provided). That is, the PV of cash flow associated with the buying alternative will be ascertained. The decision between buying or leasing will be made by comparing the NPV under each of the alternatives. The alternative having lower NPV will be preferred. Compare the present value of cash outflows from leasing option with that of buying/borrowing option. Select the option with a lower presented value of after-tax cash outflows. [Note: Principle and interest payments when discounted at the appropriate borrowing rate will always be equal to the amount borrowed. Therefore, there is no need to consider the principal and interest repayments. Provides protection against the risk of equipment obsolescence, since the lessee can get rid of the equipment at the end of the lease.